(by Clifford D. May, Fdn. for Defense of Democracies) – To be fair, the document signed in Geneva is not meant to neutralize the threat posed by those who rule Iran. It is meant only to be a “confidence building” measure, a first step toward the “comprehensive solution” that President Obama envisions – or at least hopes for. It’s not a treaty, just a “plan of action,” though its purpose, at least from the Western perspective, is to induce inaction – to persuade Iran’s rulers to halt their development of nuclear weapons. In exchange, America and the West are to stop economically ostracizing Iran. In this first phase, however, the centrifuges will continue to spin, while sanctions pressure is reduced. Small wonder Iran’s rulers have been celebrating. The preamble to the plan states: “Iran reaffirms that under no circumstances will Iran ever seek or develop any nuclear weapons.” President Obama reads that as a significant concession. But it is a claim that Iran’s rulers have repeated many times in the past. We know beyond any reasonable doubt that they have not been telling the truth. So it may seem to Iran’s rulers that the United States and other nations are now complicit in the big lie that the nuclear infrastructure they have assembled is intended only to provide electricity for kindergartens and hospitals that prefer not to rely on Iran’s abundant petroleum reserves. Call me a “naysayer” but that doesn’t build my confidence. Wall Street Journal columnist Bret Stephens rightly points out that Chamberlain actually had little choice because Britain lacked the “military wherewithal to stand up to Hitler.” That was because British politicians, with the encouragement of the British public, had for years declined to invest in Britain’s armed forces – despite the rise of militants in Germany. Also worth recalling: After Munich, Chamberlain was hailed as a hero, his agreement applauded as a great victory for diplomacy. Churchill, by contrast, stood virtually alone – denounced as a “war monger.” Opinions would change only after much of Europe was under the Nazi jackboot. Liberating Europe would require a far bloodier conflict than would have been necessary had Hitler’s ideology and ambitions been confronted earlier. Those now suggesting a parallel between Munich 1938 and Geneva 2013 may be wrong – count me among those who hope that’s the case. But it cannot be wise for us to close our ears to echoes of the past. The ideology of Nazism called for the creation of a racial aristocracy. The ideology Iran’s rulers embrace calls for a religious aristocracy. Utopian theories rooted in atheism were the principle cause of carnage in the 20th century. Is it really inconceivable that the principle cause of carnage in the 21st century will be utopian theories proclaimed to be ordained by God? In 1935, Hitler commissioned an infamous film called “Triumph of the Will.” Its theme was Germany’s claim to global supremacy. Last week, Supreme Leader Ali Khamenei addressed the Islamic Revolutionary Guard Corps, sometimes likened to Hitler’s Brown Shirts. My colleague, Reuel Marc Gerecht, a Farsi speaker and former CIA operative, noted that Khamenei spoke of zurazma’i, a struggle of wills. The Supreme Leader (the word for that in German is Führer) stressed that proud Muslims have the will to win. He implied that decadent Westerners do not. America’s wisdom and will are likely to be tested over the months ahead. Iran’s rulers interpret the Plan of Action as recognition of what they insist is their inalienable “right to enrich” uranium. They also foresee the collapse of the sanctions regime that, most analysts agree, brought them to the negotiating table to begin with. Six months down the road the Plan of Action is to be superseded by a “comprehensive solution.” Watch for delays – at least past the 2014 U.S. elections. If there is to be a serious agreement, members of Congress might want to insist that it be regarded as a treaty – which members of the U.S. Senate would ratify only if they are persuaded that the U.S. gets at least as much as it gives. My best guess (and I’d prefer to be wrong): Sooner rather than later, the sanctions rope unravels. 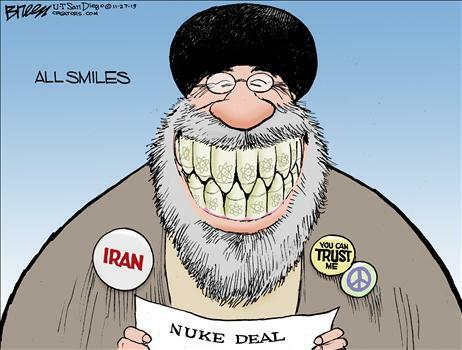 Once that happens, Iran’s rulers – the world’s leading sponsors of terrorism abroad, egregious (very bad) abusers of human rights at home, and nuclear proliferators (those who build nuclear weapons) – offer less, not more. There will be calls to reestablish and even enhance economic pressure but it may be too late. Iran’s rulers will continue toward their near-term goal: a quicksilver nuclear-breakout capability. Their longer-term goals include hegemony (control) over the Middle East, control of the region’s vast petroleum resources and the Strait of Hormuz (vital to the international economy), and impunity (freedom from punishment) for the terrorists they sponsor. Non-proliferation (preventing the spread of nuclear weapons) will be as dead as disco – the Saudis and others will obtain the weapons they need to defend themselves against what they understand to be a dangerous and unpredictable enemy. (Israel, they have always known, is not that.) Over the decades ahead, the odds of a major war, one in which nuclear weapons are used, will rise; as will the possibility of terrorists acquiring and deploying nukes. This will be the legacy we leave our children. It is often forgotten that once Hitler’s lies and ambitions became manifest (obvious), Chamberlain did not go off to write a book and make speeches defending his decision at Munich. Instead, he resigned the prime ministership and joined the war cabinet of the critic who succeeded him [Winston Churchill], a singular statesman who courageously led Britain through the years of bloodshed and peril that followed. – Clifford D. May is president of the Foundation for Defense of Democracies, a policy institute focusing on national security. Published at defenddemocracy.org on November 28, 2013. Reprinted here December 5, 2013 for educational purposes only. May not be reproduced on other websites without permission from Foundation for Defense of Democracies. Visit the website at defenddemocracy.org. 1. The purpose of an editorial/commentary is to explain, persuade, warn, criticize, entertain, praise or answer. What do you think is the purpose of Mr. May’s editorial? Explain your answer. 2. What comparison does Mr. May make between Nazism and Iran’s rulers? 3. Has Mr. May caused you to change your viewpoint on the Obama administration’s deal with Iran’s rulers? Explain your answer.